Aliya Cycon is an 8th Semester CWP major at Berklee. Her band, Aliya Cycon Project, just released their first album called “We Will Be Light” this past spring. Y: Hi Aliya, Congratulations on your first album release party! How are you feeling right now? A: You know, it has been on my mind for so long that now that it finally happened, it felt totally normal. But it was a really fun show with an awesome turn out. The crowd seemed to be really into it, which is the most rewarding feeling. Y: Could you please introduce your band members for us? A: The Aliya Cycon Project has five solid members. And we always have extra players. Right now we have a violin player. The core band members are: Andres Fronseca from Colombia on drums and percussions, Tomas latorre from Argentina on bass, Parham Haghighi from Iran on piano, Ghassan Sawalhi from Palestine on the other ‘oud, then me. That’s the five. Then we have Antoine Beux playing violin with us every show. It is very nice to have a violin, because we can have extra harmony and melodies. Y: So on your CD release party on May 13th, he was playing with you? A: Yes! And for previous shows we had a cello player. I might consider adding a wind instrument later, but I want to keep the sound in a certain way. I don’t want it to sound too….I mean, it already sounds modern and fusion enough, so I want to keep a traditional flavor. Y: What’s the instrument you play? say it’s a Middle Eastern instrument, because it is played in Turkey, Armenia, sometimes Persia, North Africa…the whole Middle East. Y: How did you become interested in Arabic music? A: It’s a long story. My dad had an opportunity to work in Palestine, with some actors in a theater. He asked me if I wanted to come. At that point I didn’t really know much about the Middle East. I had already been introduced to the sound of Middle East from way before, when I was a ballet dancer—sometimes we danced to Middle Eastern music. I always loved it. So when the opportunity came to go to Palestine with my Dad, I was like, “sure!” It was in 2012. Y: When did you come to Berklee? A: 2012. So the Palestine trip was right before I came to Berklee. Y: So the seed was already there! A: Exactly! The seed was there! You understand. I started Berklee in September 2012. Back up to February, about six months before I came to Berklee, that was my first trip to Palestine. I was living in New York during that time. So when I returned from Palestine, I really wanted to study Arabic music right way. I had already been studying music all my life, piano and jazz, so I knew a lot about music. But I wanted to understand Arabic music. So I started to study it at the Alwan Foundation in lower Manhattan. I joined an Arabic Women’s Choir. At that point I wasn’t planning to do what I have already done with Arabic music—I just loved it and I wanted to study it. That’s how I started. I started to study ‘oud only because I thought it was an interesting sounding instrument. I wanted to learn more about it. When I started to play it, I fell in love with it and I just wanted to keep doing it. I was practicing hours and hours a day. So that’s the sense behind how this whole thing worked. A: It is new, but it is also familiar, not too different. Which I will talk about later when I talk about the band. So I practiced hours a day, which helped to pass the learning curve, because I had never played a stringed instrument before, nor a fretless instrument. Y: You consider yourself as a vocalist, don’t you? Or a pianist? A: I do some singing in the band. But I would identify myself as a pianist between those two things, because as soon as I identify myself as a singer, then I start to hold myself at a singer’s standard. But I am not studying singing at all. When I don’t call myself a singer, I can just sing how I want, and I sing much better. …I didn’t get into [Arabic music] thinking I was going to pursue it. I just got into it because I loved it, and soon it appeared that I was gifted at it, for an American. I have a pretty good ear for the language and for its sounds. So a few months after [my first trip] I went back to Palestine, for the whole summer, leading up to my studies at Berklee. Y: Where do your parents come from? A: I am basically Polish by blood. My grandparents fled from World War II and came to America. They are still alive. They are living stories of that. Y: You were a dancer? A: That I have to explain. My life has taken a lot of turns. I was studying professional ballet for my entire life; I started at four or five. Then I left home at sixteen to study at Kirov Academy of Ballet in Washington, DC and then New York City. My career plan when I was sixteen was to do ballet as much as I could, study as hard as I could. I knew that I would do ballet first, and I knew that after I would finish with ballet—after an injury or if anything else stopped me from ballet—then I would pursue music. Music, you can do at any age compared with ballet. Both of these art forms take all of your time and mental energy. I tried to do them at same time, but I found myself neglecting music while doing ballet, or vice versa. You can’t really do them at the same time if you are serious. Ballet especially requires not only all the hours of your day, but all your physical and emotional energy—actually more than music. I can say that since I have done both. Ballet is a whole world, and you can’t really step outside that world, you can’t really have other interests, especially you’re in training and trying to seek a career. Ballet has to be the only thing. So that’s also what eventually stopped me from doing ballet, because there is so much more to life than ballet. Basically what happened was I was living in New York. I was studying in a ballet school that turned into a company; I was ready to be a professional. Then I started realizing that I didn’t want to dance in a company anymore; the idea became less glamorous. I was, like, “I am ready to pursue music now.” That’s when I applied to Berklee. Actually I auditioned on voice because I hadn’t played piano for so long because of ballet. I got in as a voice principal, then I changed my principal to piano as soon as I entered Berklee. Then I switched to the ‘oud a couple semesters ago, because I finally realized that ‘oud was the most important one for me. I was improving my ‘oud outside Berklee while I studied piano: different teachers, different workshops, on my own, until I realized I was ready to be an ‘oud principal. So I have had three principal instruments, but I am not going to change it since I know ‘oud is the most important one. Also, I don’t consider myself a vocalist; I only did that to get in. I was so out of shape with music when I auditioned, since I was only doing ballet, I knew jazz very well. So I sang a jazz tune, I improvised and understood the changes. I did it on voice because I was afraid I wouldn’t get in on piano. But looking back, I could gotten in on piano, but I just didn’t want to take chance. That’s been my Berklee path. Y: What’s the background of your piano training? More European classical or more Pop and Jazz? A: I started with a more European classical style, but my teacher was not strict, so I never really developed as a strong classical pianist. Then I discovered jazz and I really loved it. I guess I would say I was more jazz. Jazz is one of the things you have to practice hours a day. I haven’t been playing lately because of the ‘oud and other things, so I don’t identify myself as a jazz pianist anymore. I still appreciate that I understand it a lot. I am a tutor in Harmony, but I don’t really play jazz a lot. But knowing jazz allows me to speak a musical language, which makes my ears really good. With the band it is really helpful. A: Yes, for doing arrangements. That’s also my major, Contemporary Writing and Production. At the same time, [Aliya Cycon Project] is not a jazz group, so I don’t put a lot of jazz harmony in it. Arabic music is more about melodies than harmonies. Y: The same as Chinese music. When did the light turn on that led you to combine Arabic music with contemporary elements? A: I did Arabic music wherever I had access to it before I came to Berklee. Before becoming an ‘oud principal, I was still doing it but not with much intensity, so I felt very disconnected from it. I was not as much involved in any communities that appreciated Arabic culture. I was kind of doing it on my own; I felt very detached. I was playing a lot of Jazz piano. But then I went to the International Folk Music Festival in the BPC. There was a piece from Iraq, with Arabic musicians playing their instruments. Something in my heart exploded—I could not ignore this passion any longer, I needed to do something about it. So I switched my principal to the ‘oud the next week. Y: It’s so cool that Berklee has the ‘oud as a principal. A: Yes! There are only five of us. The next summer I started the Project. Ever since, I have been very involved in Arabic music. I have played in a lot of Arabic Cultural Centers, etc. I am actually an intern at the Center for Arabic Culture in Somerville. With my band, sometimes we play for people who know nothing about Arabic music; other times we play for more Arabic audience. It has been really fun adventure. Y: When do you graduate? Now I am a little worried. My graduation is next year; I have to figure out how to survive with this. But doing this internship at the Center for Arabic Culture is nice, and it is good for my resume. Then maybe I can continue to work at other Arabic culture centers. Y: How did you find your band members? Same with the album, I wanted to be like “I need to have all my songs perfectly arranged before I book a studio time.” No. I booked the studio time. “All right! We have two months until we record this album.” That forced me to prepare for it, instead of preparing everything, and then booking a studio time. You see the difference? Everyone can do it, you just have to have that mentality. A: It’s funny about dreams coming true. It was always my dream to have a band. It was always my dream to have a lot of those things that have happened. Y: The same for me. A: Including playing Arabic music with many people with certain groups, getting certain gigs in certain venues that I had never thought would be possible. A lot of these things happened. The funny thing about that is we think that when our dreams come true, for the rest of our life we will be walking around glowing and feeling great. The funny thing is when your dreams come true, you are so happy for that one night, then life goes back to normal. Then you have another dream that you work for. You start to feel that the dream coming true was normal. Y: That’s true. If you stay there, then what about the next dream? A: Yeah, I am always asking “what’s the next thing?” Although now it is a little weird, as I am going away for a month in July. A band member or two have graduated now and will move to New York. The band is going to continue, but there probably will be some changes. We have two big gigs and two small gigs before I leave. I don’t know how to think ahead right now, I don’t know how I’m gonna change in the month that I am gone. Y: Where do those melodies of your compositions come from? Are they from Arabic music? A: No, they are my own melodies. But they are of a repeated nature, and more predictable. In Jazz and Western music, the objective is to have more unpredictable melodies. You have to go all over the place, especially in Jazz. Arabic music is much more predictable, because the beauty is not in that element of surprise, but in how the melody is played, and how expressively. You can augment and ornament the melodies; that’s where the beauty is. So my melodies are repetitive and kind of predictable. Then I encase them in a good arrangement, cool sections and interesting instrumentation. Y: You have those attractive cues. A: Yeah! Exactly. The Jazz music and songs usually start with the chords, but when I do composition for this band, I always start with the melodies. The melodies are where the words are at. I think that’s why people like my music, because it is really easy to latch on to, even for amazing musicians who theoretically don’t like simple music. Any person would relate to music that’s easy to catch—when you take digestible, repetitive melodies into a good arrangement and your arrangement takes some surprising turns. I think that’s the recipe that has made the music successful. Our band also has amazing arrangement ideas we did on the spot or in the rehearsals. So, start with the melodies; the rest of the arrangement brings the song to life and gives it its character. So the repetitive melodies, a lot of sequence, the modes and scales, and the sound of the ‘ouds give the music an Arabic sound. Y: You wrote some lyrics for two of your songs in the Album. A: I don’t like putting lyrics for all the songs. I wrote several just for fun. People like the singing portion. I am still figuring out how to do that, because it makes the music sounds un-Arabic. I sing in English. There is nothing about the way I sing that makes it Arabic. I can sing in Arabic, but writing lyrics in Arabic is tough. However, I am really thinking of having someone to write lyrics for that. There are some specific ways to put Arabic lyrics into music. Y: “We will be light”, the ideas really stand out in your song. How did you come up with the lyrics and decide to use it as the title of this album? A: That song is for my grandmother who has passed away. At the time I wrote that, I was really thinking about what happens in the end. It has two meanings. One is that we will become light someday—we will all end up in a heavenly place. The other means light as in not heavy, meaning we will be happy. When I named the album, I was attached to the idea of using some lyrics from the album’s songs. Some people title their album with one of their songs, but I don’t want to name the album for one song, as it makes that song seems more important than the rest. There isn’t one song that is most important on the album. Although I did consider naming it “Beginning”, which is one of my songs, which could be a very appropriate title, but a lot of people were against that idea. It is kind of cliché, the first album called “Beginning”. I thought about different things. In the end, the line “we will be light” is really nice; I proposed it to some people, and they liked it. Then I stuck with it. It is uplifting and memorable. It had many ways to interpret it. Most of my songs have a one-word title; this is different. Y: How about the design of the album? A: My grandmother who passed away was an artist. Whenever I played ‘oud for her, which she loved, she sketched me. The front of the album is a sketch she did of me. Y: This is a very touching story. A: The whole album is dedicated to her. Also, when she passed away, she left my sister and me some money. She wrote, “use this money for something special”. My sister used it for her yoga teacher training, I used it for the album, and it helped a lot! (laugh) It allowed me to get a good quality project. Y: How is the production process? I asked around about who would be a good engineer. A good engineer is super important since I was producing and playing; I didn’t want to have technology to worry about too. When you have an engineer who cannot fix a problem, that really stresses out the producer or person who is in the leadership role. So I found an incredible guy, Pablo San Martin, who has worked in the specific studio where we recorded, the Recording Company. He had worked there thirty times; he knew all the gear. He knew everything, so that there were no surprises for him – the most important thing. He also mixed the album. We recorded the album two days before the Christmas break. When Christmas happened, the session sat on a hard drive for a month. When we came back for the new semester, I had to force myself to be on top of it. I called the cello player to do overdubs, “Give me your date; now we’re gonna book the overdub session.” Called the percussionist…I did everything as soon as possible. Y: It wastes energy on making such decisions that you don’t need to. A: So I booked that, contacted everybody. Then every weekend, I was going to the engineer’s house to work with the overdubs, make sure the players had a very clear part to read, and then comp the takes with the engineer afterwards. There were four or five weekends I was in his house. I did overdubs for my vocal; vocals take a lot of time, so doing it in the main session is bad; it is much better to do an overdub. It was a long process. Then I had to cooperate with the designer of the album cover. I need to uploaded that to DiscMakers, contact a mastering engineer, what to name the album, what to write on the album. It took a lot of steps, a lot of actions. It is like “I know I want a nice photo on the back of the album.” So find a photographer, go! Every step, you need to be on the top of it. Now it’s nice that when we have a gig, we have something to sell and come home with some cash. None of our gigs are for free now. We always get paid for our gigs, which is amazing. Before, nothing was paying us. It feels good to pay my musicians. For Ryles, every musician got $50 each for six musicians, after paying all the fees! Y: You mean that change happened when you had the album? A: It coincided. We became a more established group, and then we got more paid gigs. We play in venues that pay for musicians. I learned a lot about the music world through this process. The digital distribution of the album is a whole other process. I registered with ASCAP. I learned a lot through this process—who to cooperate with, how to hire people, how to be more decisive on things, be professional. Y: The last question I want to ask is about the future. A: I have been thinking about that so much, especially since so many friends graduated, seeing them get thrown into the big world. I am sure the band will continue through the next year. I just have to replace anyone who moves. We can play in the same venues we played in the past, we have a nice professional video going on YouTube; that will help us to get gigs. I am working on my press kit. I guess the band is going to keep going through the next year. Then I am going to graduate. I am gonna probably move to New York; that’s a whole other world. Fortunately, I have lots of contacts in Arabic music in New York who are professional players now. But still, it’s not as if you walk in there and you work. If I am able to transfer the success of my band to New York, then after a while, it will be the same things as here. We get two or three gigs a month; we make a couple hundred bucks each night. That’s not a living. I want to play with the band, but I have to be doing something else. But of course I would love the band to get huge, my music to get huge. There are certain artists that I have taken inspiration from career-wise. Not necessarily their music, but their careers. For example, Yanni, who is a Greek American musician. I think Aliya Cycon Project has potential. I fully believe that if I keep pushing and pushing it, keep on working, not ever let myself get lazy, and remember that idea to never let an idea slip away without me acting on it—I fully believe that if I keep doing that, being myself, being strong, and being forward with people, I am sure [the project] will get bigger. But the reason I mentioned Yanni is my dream is my goal to play in a huge venue. Have you ever being to the commencement concert? Y: Yes! Of course! Oh, next year, you gonna play there? A: I don’t know if they will search for an ‘oud player. A: When I went to the commencement concert, I thought “Wow! People I know are getting to perform in this type of venue.” Makes me realize that I would love to perform in a huge venue like that. That would be a dream come true. I believe we have the potential, honestly, if I keep pushing hard, if I continue to be an idealist. I get really broken down when people talk to me about the reality of the industry. I don’t want talk or think about it; I just wanna keep on doing what I am doing and breaking down any walls that come in front of me, which has so far happened. A: Yanni, I brought him up because he is not a pop singer, but he plays for these giant crowds. He has a huge audience; people love him. He plays world music, pretty instrumental stuff. So he is an example of someone who is “pop famous,” but doing cool world music. His career is interesting; I want to study him more. I am going to Greece a little bit this summer and I’ll find out what his deal is. At the same time, I also know I need to get better myself. 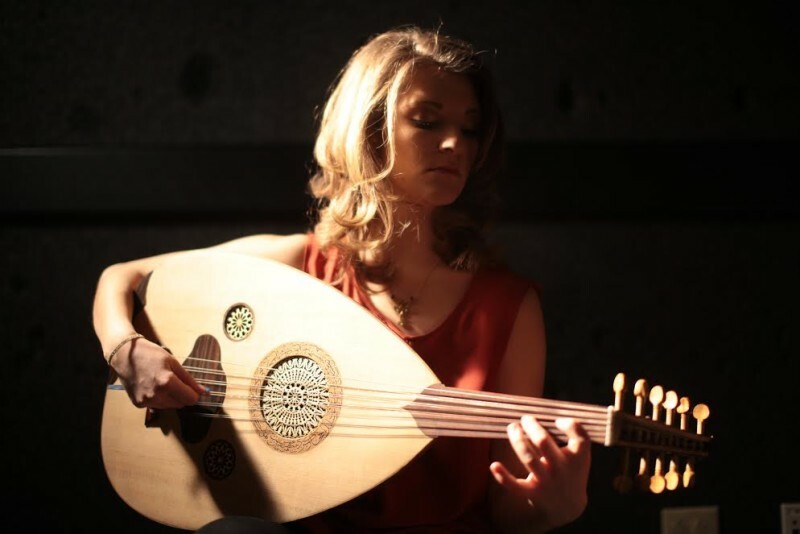 I would love to be in demand as a good ‘oud player, besides my band. It is nice to have a band, but I also want to be a valuable player for other people. I am gonna going home and practice once this is done. Haha!